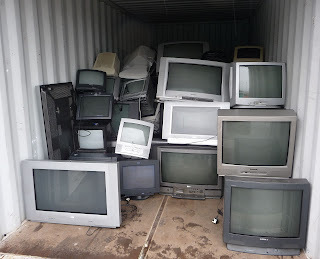 The TV I bought a few years ago in order to receive whatever it is that changed and made our old televisions obsolete began developing problems a few weeks ago. When I turned it on nothing would happen until I unplugged it, plugged it back in, and turned it on, and then waited. And waited. The waiting times grew longer and longer until I got fed up with it yesterday. I took it to an appliance service store, only to find they don't work on this particular brand. They assured me that the cost of diagnostics and any repairs would soon be more than buying a new television. So, for less money than I paid for the first television with a DVD player, I bought a bigger TV and a blue-ray player. What to do with the old one, I asked. Oh, the clerk told me, people just throw them out. It makes me feel old. I grew up accustomed to televisions that lasted a long time, clock radios that lasted a long time, appliances that could be repaired, even shoes that could be repaired. Now we just throw 'em out.